Evanescence performing at Shoreline Amphitheatre in Mountain View, CA. September 5, 2018. Photo Credit: Jared Stossel. A chilly Wednesday night in Mountain View played stage to one of the more unique concerts to head through the Bay Area this summer concert season. In a unique pairing, alternative metal act Evanescence brought their co-headlining tour with violinist Lindsey Stirling to Shoreline Amphitheatre. The show filled nearly every seat in the massive amphitheatre, but instead of a hard-rock show that you might have seen in the early years of Evanescence's career, the band performed with a thirty-piece orchestra. The stylistic change in the band's sound was marked with the release of Synthesis, the first album the project has released since their 2011 self-titled album, and it plays well in a live setting. Adding in a breathtaking performance from Stirling as a co-headliner, and that's just icing on the cake. 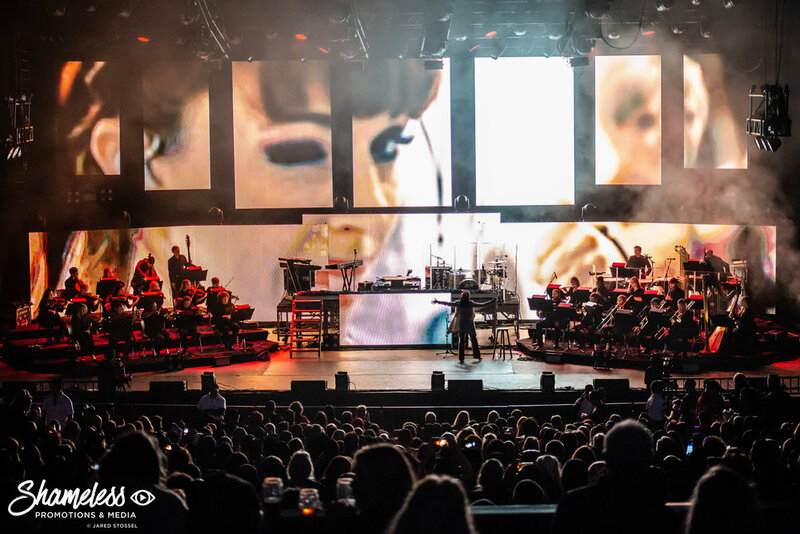 Lindsey Stirling's hour and fifteen minute set brought forth one of the most impressive shows the Bay Area has seen all year. Stirling's rise as a performer has been well documented in the media, given her time on America's Got Talent where she made it to the quarter-finals. It's rather ironic seeing how judges on the show like Piers Morgan told Stirling that she's just "not good enough", and yet here we are as she fills an entire amphitheater of 22,000 people. Stirling's performance was inspiring, and a testament to the fact that hard work, perseverance and goals do pay off. Evanescence took the stage about twenty minutes after Stirling's performance wrapped up, showcasing a brand new chapter in the band's career. Iconic tracks from the band's career like "Lacrymosa", "Bring Me To Life", and "My Immortal" were performed. Gone were the hard rock moments that originally made the band an icon among teenagers in the early 2000s; in its place were vibrant, dark and powerful orchestral numbers that transfixed the audience. The band even performed a cover of "Across The Universe" by The Beatles. Both artists also managed to make appearances in one anothers' sets throughout the evening with vocalist Amy Lee appearing in Stirling's performance of "Shatter Me", and Stirling appearing on stage with Evanescence during "Hi-Lo" and the encore mashup that brought the evening to a close. 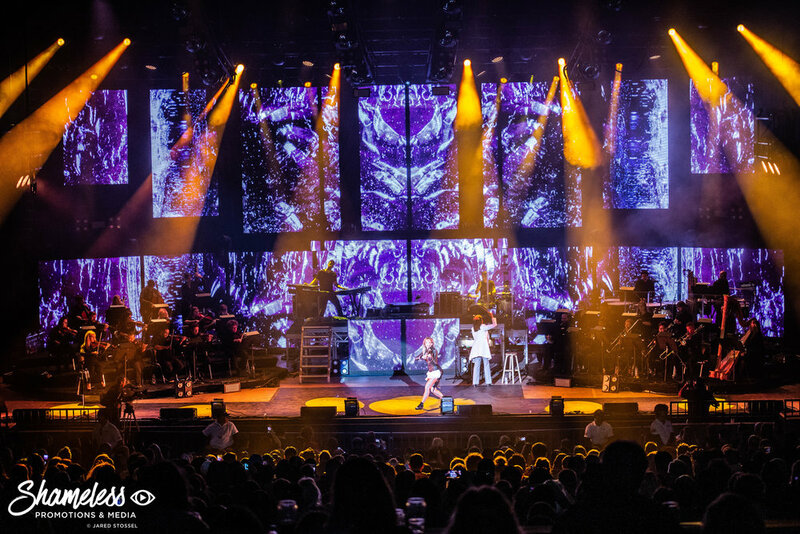 Fans in attendance didn't just witness a concert on Wednesday evening; they saw a true performance.